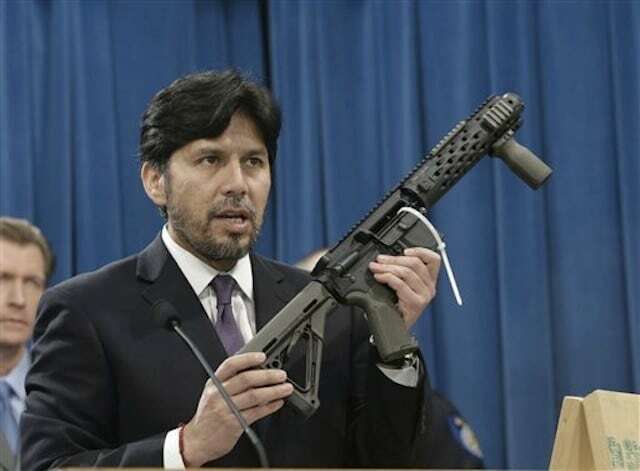 State Sen. Kevin De Leon, D-Los Angeles, tried explaining the dangers of a “ghost gun” during a discussion over proposed legislature in California last Monday. As the first month of the new year draws to a close, bills that didn’t gain traction in 2013 face an impending deadline. If they don’t pass the house before Feb. 1, they’ll disappear. With little time remaining, De Leon gave one last push for SB808, a bill that would permit the homemade manufacture of “ghost guns,” so long as the builder underwent a background check first, News Observer reports. “This is a ‘ghost gun,’ De Leon explained. It’s a gun pieced together instead of purchased as a whole. In his attempt to rally support for his soon-to-be-dead bill, De Leon points out some of the more notable features of the one-of-a-kind rifle. “This is a ‘ghost gun.’ This right here has the ability with a .30-caliber clip to disperse with 30 bullets within half a second. Thirty, magazine, clip, in half a second,” he said. De Leon is also working to pass SB199, a bill that would require all toy guns — including airsoft guns, BB guns, and pellet guns — to look distinctly different from their real counterparts.